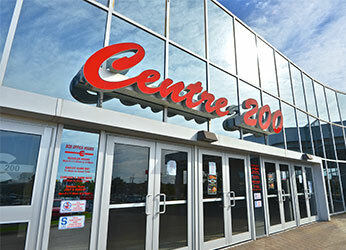 Centre 200 is Cape Breton’s primary sports and entertainment facility, located at 481 George St., Sydney, Nova Scotia. It is home to the Cape Breton Screaming Eagles and Cape Breton Tradesmen. Besides ice hockey, the arena hosts many other events, such as rock concerts, figure skating, antique/custom car shows, and now CaperCon! The convention entrance and parking will be the back of Centre 200. Parking in front, around Tim Horton’s or the Casino, may result in towing, as those parking lots do not belong to C200. Gender neutral bathrooms are also present in the convention centre. Being in the downtown core of Sydney, C200 is seconds away from a Tim Horton’s, several pizza shops, bars, and a variety of restaurants that serve international cuisine. Tickets for CaperCon 2018 can be purchased at the Centre 200 Box Office if you prefer to buy them in person or with a payment type that is not supported online. Come Play with CaperCon at Centre 200!